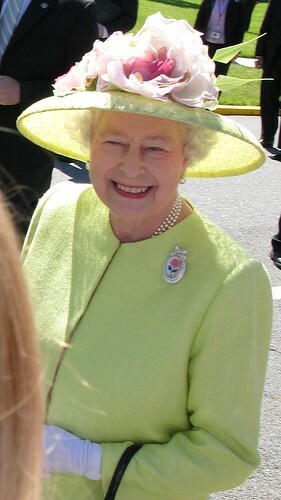 Queen Elizabeth II, originally uploaded by Sci-Fi Laura. Ed. Note: As one man operation here at PoP I wear many hats. In addition to intern coordinator I also act as the ombudsman. From time to time I find it necessary to respond to a reader’s complaint. You can see previous ombudsman responses here. To be honest I’m not exactly sure what are the implication of these comments. But I suspect they imply that the advertisers influence the content on this blog. Well, I just want to clear up that misunderstanding right away. After lengthy negotiations, I have been given permission to reveal the true power brokers behind this blog. And they are, of course, the Pentavirate. It turns out that my many postings about flowers and gardens did not go unnoticed by the Pentavirate. I’m not going to get into the details of how they contacted me but suffice it say I was given an offer I couldn’t refuse. It seems the group was interested in recouping their losses from “Tulip Mania”. Many folks may remember this lucrative market from the 1630s. So if you want to support this blog please plant tulips in your garden next year! MPD was looking for a “Hispanic male suspects that fled” the scene, according to Chief Diane Groomes. And Council Member Graham happened to actually be on the scene and believes it may have been gang related. So there it is. Very sad and very disturbing on so many levels. As I have said many times before, this park is one of my absolute favorite spots in the city. It truly is a gem. However, I am also not naive and realize that crime had been an issue in this park in the past and after nightfall it can still be problematic from time to time. I guess I found this instance particularly disturbing, of course crime at all hours is disturbing, because of the time of day it took place – between 5 and 6pm on a beautiful Saturday. And here’s another problem I have – how on earth could the Washington Post not report about this. It’s not like it is a little pocket park. After Rock Creek Park this is one of the prime park locations in the city. I wonder if they would have reported on it had it occurred in Rock Creek Park? But this leads me to the second part of the title of this post – what is a blogger’s responsibility when posting about crime? While the Washington Post is generally a great newspaper, clearly it can’t be counted on all the time. As a matter of fact no other publication made mention of this incident (though DCist did link to my original post.) I think this is what puts me in a unique position. Obviously I’m not personally (thankfully) witnessing these crimes. However, PoP, has become a place where people know that matters of crime will be discussed no matter which neighborhoods they occur in. Furthermore people know and trust that the information they send will be posted and posted anonymously. I take this responsibility, and I do see it as a responsibility, very seriously. In this particular instance I posted the reader’s email because I had received multiple emails of reports about numerous police and ambulance on the scene. So I figured something had to be going on. I also believe that PoP is unique in that it generally has a very quick self correcting community. If this had been bogus or if no others had reported seeing first responders then I either wouldn’t have posted in the first place or I would have corrected the initial post. The fact of the matter is, often the only place folks feel comfortable sharing information and incidents like this is on PoP. But what I have worked very hard towards is gaining your trust. I think I have earned it with many of you. I have no ulterior motives with these posts other than getting the information out there and hopefully readers and/or the authorities will confirm or deny it. Therefore, I have no problem posting information about crime that I believe is likely reliable. It is not a perfect science. Like I said I’ll gladly amend the report should the facts emerge to contradict an initial post. And believe me, the last thing I want to do is incite fear. I hope it is obvious by now, but I truly love this city and wish I could only post about new restaurants, buildings, gardens etc. Sadly, that is not the sum of our experiences living in the city. So I’ll continue to be an outlet when we are let down by those who have far greater resources than I. However, we should not underestimate the resources that we do have. And that resource is of course the great community of readers, commenters and tipsters. DSCN4260, originally uploaded by Prince of Petworth. 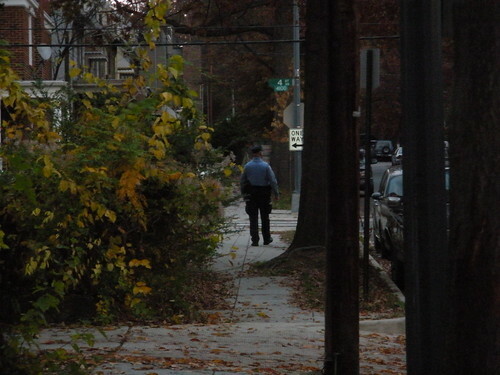 A few readers have asked me why I didn’t write more about the recent shootings in Petworth this weekend. I actually thought pretty hard about this decision. I did post about the first shooting and I felt that City Paper did a good job covering the rest. But of course the real reason I didn’t post about each individual shooting was because I didn’t want to obsess about it. Believe me, I was very upset, frustrated, sad, all the emotions I feel after I hear about a shooting. (And I’ll gladly post anything that one thinks can help the situation). But the thing is, when I write about shootings people obsess about it. I know that sounds harsh but I can’t count how many times people say Petworth is a crime filled slum or other such tripe after a shooting. The fact of the matter is that the shootings are devastating but number one, thankfully, they are not terribly common and two they don’t represent what day to day life is really like in Petworth for me. Now let me say again, these shootings are brutal, they need to be addressed, we need a greater MPD presence particularly with foot patrols, we need volunteers to mentor the youth, hell maybe we’ll even need the Guardian Angels, we need to do lots of things but these crimes do not define our life in Petworth. I remember speaking recently with my parents friends who live and lived in Park Slope, Brooklyn during the 80s. The told me how much crime there was – muggings, shootings, drug dealing etc. And you know what? Today, Park Slope is one of the most desirable neighborhoods in Brooklyn. I believe Petworth will follow a similar path. Now, I can’t speak for everyone but personally I’m not going to let the reports of crime ruin my image of the otherwise amazing neighborhood we live in. You know, when I lived in Cleveland Park, I saw a shooting right in front of the zoo. It was awful. But I didn’t flee Cleveland Park and I’m not going to flee Petworth. Look, life isn’t all flowers and beautiful doors here. No doubt, it can be rough. It’s not for everyone. But it is definitely for me and I suspect many others reading here. Now, MPD, how ’bout you throw us a bone and honor your word by giving us a couple of foot patrols? You can read a previous Ombudsman response here. Recently I have received a number of comments/emails from folks who are unhappy with the coverage at PoP. Some ask why I’ve stopped focusing on Petworth? Some are just hate filled. I’ve never really understood how a blog like PoP could generate such hatred. I think it’s a fairly innocuous site. The site is constantly evolving. I live in Petworth and as long as I do the site will be called the Prince of Petworth or PoP. As difficult as it is for some to understand, it is just a name. And a goofy one at that. But, really, it is just a name. This blog obviously covers issues and neighborhoods citywide. I try and write about development, restaurants, architecture, real estate, quality of life issues and other things that I find interesting. Fortunately most of this material resonates with the readers. No disrespect intended, as I’m always sad to lose readers, but if you decide not to read anymore don’t feel like you have to announce it in the comments section. Especially if you are anonymous. Quite frankly, nobody cares if “anonymous 3:14 pm” reads it or not. IMGoph comments: “i’m honestly a little intrigued about your “sources”. are people in the councilmember’s office giving you information that the rest of the citzenry is not privy to? if so, does that make you feel a little uneasy knowing that the democratically elected members of our government could be withholding information from some of their constituents and giving it to others? I readily admit I am no Woodward nor Bernstein. I am actually a Silverman. But that’s neither here nor there. My “sources” come from everywhere. Ed. note: I’m not quite sure why everyone puts sources in quotes I promise my sources are not figments of my imagination. A source is simply one who gives information. Why do they give this information? I’m sure it is for a variety of reasons. Some are whistle blowers. Some hope to advance their own agenda. Some are simply friends. Sources are actually quite common in this country. Believe me, I find it as hard to believe as you do but PoP has actually become a bit popular in our nation’s capital and if folks want to give me information I’m not going to deny them that. It doesn’t make me uneasy in the slightest. I don’t think getting “inside information” can be extrapolated to mean that “developers bidding on projects might be getting inside info as well”. For the record I also don’t think my sources have any correlation to the advancement of big oil nor the demise of the US auto industry. So what do you guys think about sources? Are the use of sources sketchy or legit? Previous ombudsman responses can be read here, here and here. Well, sir or madam if you look at the photo of Congresswoman Norton her arms are crossed and she is obviously chilly. Thus the title, “One Cool Congresswoman” was merely referring to the fact that she was feeling cool. Sometimes a cigar is just a cigar. “Let’s stick to the hipster blogging”. Well, I’ve been waiting a year and a half to be called a hipster blogger and I can only respond thank you. For the past year and a half I’ve been wearing exclusively puma hoodies in winter and summer, riding a 10 speed bike with only one working gear, reading books that I don’t understand and listening to terribly obscure music that I don’t even enjoy. Until today I thought it was all for naught. So thank you dear sir or madam for recognizing who I really am. I tip my camouflage hat to you. “Leave political commentary to those that know something about it”. I knew when I asked the Congresswoman what neighborhood she lived in that I’d have to deal with accusations like this one. When I wrote that the Congresswoman grew up on Kenyon Street I nearly deleted the entire post. For I suspected that I’d be labeled a wannabe political hack. And there is nothing that upsets an aspiring hipster more than being labeled a wannabe political hack. But damn it, sometimes you can’t sit on the truth even if it is as controversial as reporting that the Congresswoman currently lives on Capitol Hill. I, sir or madam, would not have been able to live with myself. Please forgive the brief reply but I’m late for a show at the Rock and Roll Hotel.